The Earth became tilted during its formation due to the rocks that keep hitting into it. Approximately around 4.54 billion years ago, our Solar System formed out of the dust and gas that were the remnants of the Big Bang. First to form was the Sun, which was hot and dense. Due to the Sun’s gravity, the other dust within the system started revolving around it. Then the force of a nearby nebula caused the dust to break orbit and crash into each other. As the dust was hot and the force of its impact enormous, the dust particles started fusing with each other to form rocks. Some of these rocks became so big that they went on to become the future planets, asteroids, and moons. However, as these rocks were forming they were constantly knocking into each other. About a billion years ago, as the Earth was forming, a large planetesimal (rock), approximately the size of Mars crashed into it. This crash knocked the Earth off of its center. This caused the Earth to gain the tilt of 23.5 degrees that it has today. The crash had another impact. It also caused a big chunk of the Earth to rip off from the original. This chunk went on to become the Moon. The 23.5 degree tilt on Earth is very important for us. 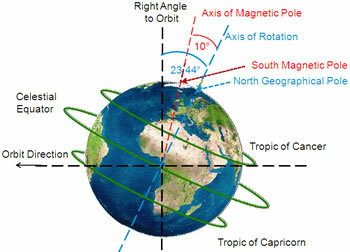 The Earth’s tilt is what facilitates the seasons. As the Earth revolves around the Sun, the tilt causes one pole to be tilted towards the sun, whereas the other pole is tilted away. The hemisphere that is tilted towards the Sun during the revolution experiences summer, whereas the hemisphere tilted away from the Sun experiences winter. If the Earth did not have a tilt, we would still have seasons. However, the summer would be extremely hot, while the winter would be extremely cold. The heat and cold would be too extreme to allow anything to grow. Hence, we can effectively thank the Earth’s tilt for life as we know it. Furthermore, scientists state that while the Earth’s tilt is stable over long periods of time, the planet actually wobbles on its axis like a top. This phenomenon is called precession. It is because of precession that the date of the seasons will eventually change over 25,800 year cycle. Hence, at some point in the future, the times for summer and winter will eventually switch, so that it will summer in the northern hemisphere during December and winter during June.